Four persons, including two SFI Kannur District leaders, were arrested on Thursday in the case related to the attack on Chief minister Oommen Chandy here on October 27. Kannur District SFI President Prashob and secretary Sarin Sasi and two other activists were arrested while they were participating in a dharna before the district Collectorate, police said. The SFI had taken out a protest rally to the police station condemning the arrest. CPM Kannur District secretary P Jayarajan, CPM State Committee members M V Jayarajan and K K Ragesh went to the police station, where M V Jayarajan picked up an argument with the police, for denying them entry into the police station. Chandy was injured in the stone pelting incident when he went to inaugurate the valedictory function of the Kerala Police athletic meet on October 27. 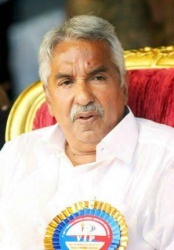 Chandy was injured in the incident and was admitted at the Thiruvananthapuram Medical College.